This is a very influential person in the church. They have a lot of maturity and pull with those in authority. This is like the first person you help see the next step. 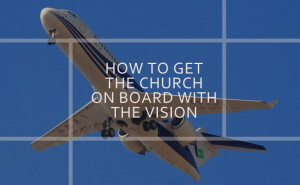 Answer all the questions and cast the vision for Kingdom fruit, not just programs or process. These are like your “Mighty Men” who guard and help push the vision with understanding and conviction. They should not only be people that are influential, but should be close to you as a leader. This is your team of front line leaders. They could be key staff and leaders, small group leaders, deacons or just key volunteers. This team needs to be definitive and communicated to with great passion and detail. This group will field most of the questions and concerns that don’t come to the first chair leader. So they need to be fully informed and understand the next steps and know why they are important. They need to be sold out and speak positively about the vision. Jesus didn’t leave us with a command to cast vision we might receive from God through prayer, dream, word, prophecy, impression or inner voice?! We were given a command to proclaim the Good News of the Gospel, nothing else!